RevMedx, Inc. today announced that the XSTAT hemostatic device has been successfully deployed on a patient in a field setting. The use of XSTAT on a soldier was the first documented clinical use of the product since its release. 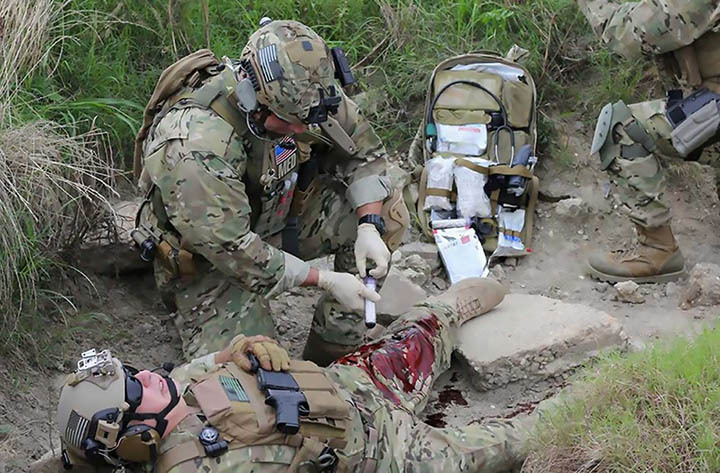 After failing to staunch severe bleeding in the patient using standard hemostatic technologies, a United States forward surgical team (FST) used XSTAT to achieve almost immediate hemostasis. Based on information released from the US Military, a coalition forces soldier was wounded in action with a gunshot wound to the left thigh. The femoral artery and vein were transected and damage to the femur and soft tissue left a sizable cavity in the leg. After a self-applied tourniquet stopped the bleeding, the patient was transferred to an FST for evaluation and treatment. After proximal and distal control of the vessel was achieved, several hours were spent by the team trying to control residual bleeding from the bone and accessory vessels. Throughout the course of the roughly 7-hour surgery, multiple attempts at using bone wax and cautery on the bleeding sites were unsuccessful and the patient received multiple units of blood and plasma. Eventually, the FST team opted to use XSTAT and applied a single XSTAT device to the femoral cavity— resulting in nearly immediate hemostasis. The patient was stabilized and eventually transported to a definitive care facility. Based in Wilsonville, Oregon, RevMedx is a privately held medical device company whose goal is to design, develop, and manufacture innovative medical products that save lives. Our product line includes XSTAT, XGAUZE™ , AirWrap™ , PARABELT, and TX Series Ratcheting Tourniquets. Our product line includes XSTAT, XGAUZE, AIRWRAP, PARABELT, and TX Series Ratcheting Tourniquets. Additional information about RevMedx and our products can be found at www.revmedx.com.